The Basilica of St. Mary of the Angels and the Martyrs (Latin: Beatissimae Virgini et omnium Angelorum et Martyrum, Italian: Santa Maria degli Angeli e dei Martiri) is a titular basilica church in Rome, Italy built inside the ruined frigidarium of the Roman Baths of Diocletian in the Piazza della Repubblica. 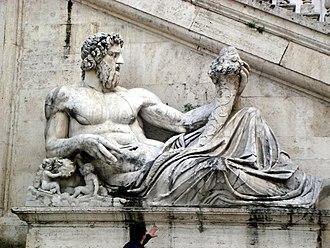 It was constructed in the 16th century following an original design by Michelangelo Buonarroti. Other architects and artists added to the church over the following centuries. During the Kingdom of Italy, the church was used for religious state functions. The basilica is dedicated to the Christian martyrs, known and unknown. 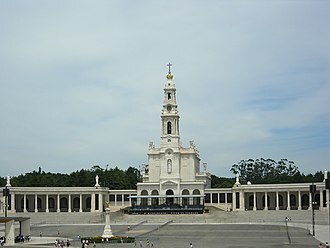 By a brief dated 27 July 1561, Pius IV ordered the church "built", to be dedicated to the Beatissimae Virgini et omnium Angelorum et Martyrum ("the Most Blessed Virgin and all the Angels and Martyrs"). Impetus for this dedication had been generated by the account of a vision experienced in the ruins of the Baths in 1541 by a Sicilian monk, Antonio del Duca, who had been lobbying for decades for papal authorization of a more formal veneration of the Angelic Princes. A story that these Martyrs were Christian slave labourers who had been set to constructing the Baths is modern. It was also a personal monument of Pope Pius IV, whose tomb is in the apsidal tribune. The thermae of Diocletian dominated the Viminal Hill with their ruined mass. Michelangelo Buonarroti worked from 1563 to 1564 to adapt a section of the remaining structure of the baths to enclose a church. Some later construction was directed by Luigi Vanvitelli in 1749. At Santa Maria degli Angeli, Michelangelo achieved a sequence of shaped architectural spaces, developed from a Greek cross, with a dominant transept, with cubical chapels at each end, and the effect of a transverse nave. There is no true facade; the simple entrance is set within one of the coved apses of a main space of the thermae. The vestibule with canted corners and identical side chapels—one chapel has the tomb of Salvator Rosa, the other of Carlo Maratta—leads to a second vestibule, repeated on the far side of the transept, dominated by the over lifesize Saint Bruno of Cologne by Jean Antoine Houdon (1766). Of the Saint Bruno, Pope Clement XIV said that he would speak, were it not for the vow of silence of the order he founded. The raised space of the tribune. The great vaulted transept emphasized the scale of the Roman constructions, 90.8 meters long, and with the floor that Michelangelo raised to bring it up to the 16th century street level, 28 meters high. Raising the floor truncated the red granite Roman columns that articulate the transept and its flanking spaces. Michelangelo made the transept 27 meters wide, thus providing vast cubical spaces at each end of the transept. In 2006, Polish-born sculptor Igor Mitoraj created new bronze doors as well as a statue of John the Baptist for the basilica. In April 2010, a five metre high bronze statue of Galileo Galilei Divine Man (designed by 1957 Nobel laureate Tsung-Dao Lee) was unveiled in a courtyard within the complex. 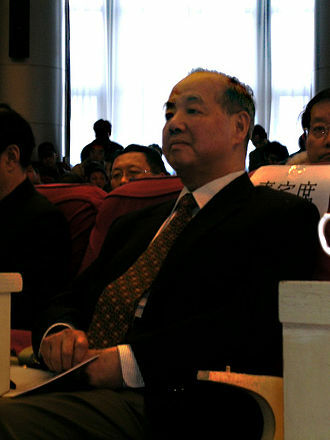 The statue (a dedication to the 17th century scientist and philosopher) was a donation from CCAST (China Center of Advanced Science and Technology) and WFS (World Federation of Scientists). Santa Maria degli Angeli was the official state church of the Kingdom of Italy (1870–1946). More recently, national burials have been held in the church. The church hosts the tombs of General Armando Diaz and Admiral Paolo Thaon di Revel, who were successful commanders during World War I on the Italian front. Also today the Basilica is used for many ceremonies, including the funeral of soldiers killed abroad. At the beginning of the 18th century, Pope Clement XI commissioned the astronomer, mathematician, archaeologist, historian and philosopher Francesco Bianchini to build a meridian line, a sort of sundial, within the basilica. Completed in 1702, the object had a threefold purpose: the pope wanted to check the accuracy of the Gregorian reformation of the calendar, to produce a tool to predict Easter exactly, and, not least, to give Rome a meridian line as important as the one Giovanni Domenico Cassini had recently built in Bologna's cathedral, San Petronio. Alan Cook remarked, "The disposition, the stability and the precision are much better than those of the famous meridian... in Bologna". This church was chosen for several reasons: (1) Like other baths in Rome, the building was already naturally southerly oriented, so as to receive unobstructed exposure to the sun; (2) the height of the walls allowed for a long line to measure the sun's progress through the year more precisely; (3) the ancient walls had long since stopped settling into the ground, ensuring that carefully calibrated observational instruments set in them would not move out of place; and (4) because it was set in the former baths of Diocletian, it would symbolically represent a victory of the Christian calendar over the earlier pagan calendar. Bianchini's sundial was built along the meridian that crosses Rome, at longitude 12° 30' E. At solar noon, which varies according to the equation of time from around 10:54 a.m. UTC in late October to 11.24 a.m. UTC in February (11:54 to 12:24 CET), the sun shines through a small hole in the wall to cast its light on this line each day. At the summer solstice, the sun appears highest, and its ray hits the meridian line at the point closest to the wall. At the winter solstice, the ray crosses the line at the point furthest from the wall. At either equinox, the sun touches the line between these two extremes. The longer the meridian line, the more accurately the observer can calculate the length of the year. The meridian line built here is 45 meters long and is composed of bronze, enclosed in yellow-white marble. In addition to using the line to measure the sun's meridian crossing, Bianchini also added holes in the ceiling to mark the passage of stars. Inside the interior, darkened by covering the windows, Polaris, Arcturus and Sirius were observed through these holes with the aid of a telescope to determine their right ascensions and declinations. The meridian line was restored in 2002 for the tricentenary of its construction, and it is still operational today. ^ Alan Cook, "A Roman Tercentenary" Notes and Records of the Royal Society of London 56,3 (September 2002), p. 273. ^ "osservazione_stelle ITALIANO Basilica di Santa Maria degli Angeli e dei Martiri alle Terme di Diocleziano di Roma" (in Italian). Basilica S. Maria degli Angeli e dei Martiri. Retrieved 2009-09-29. La stella veniva osservata con un telescopio portatile posto sulla Linea. ^ David M. Cheyney, Catholic-Hierarchy: Santa Maria degli Angeli. (containing a complete list of the Cardinal Priests). Retrieved: 2016-03-16. ^ For the period 1565–1592, see Guilelmus van Gulik and Conradus Eubel, Hierarchia catholica medii et recentioris aevi Volumen III (Monasterii 1923), p. 65. For the period 1593–1687, see Patricius Gauchat, Hierarchia catholica medii et recentioris aevi Volumen IV (Monasterii 1935), p. 45. Wikimedia Commons has media related to Santa Maria degli Angeli e dei Martiri. Santa Maria degli Angeli e dei Martiri alle Terme di Diocleziano official website. Galileo Galilei was an Italian polymath, physicist, engineer and mathematician. He played a role in the scientific revolution of the seventeenth century. Galileo worked in applied science and technology, inventing an improved military compass, Galileos championing of heliocentrism and Copernicanism was controversial during his lifetime, when most subscribed to either geocentrism or the Tychonic system. He met with opposition from astronomers, who doubted heliocentrism because of the absence of a stellar parallax. He was tried by the Inquisition, found vehemently suspect of heresy and he spent the rest of his life under house arrest. He has been called the father of observational astronomy, the father of modern physics, the father of scientific method, and the father of science. 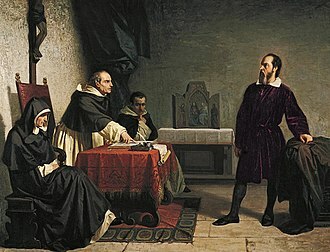 Galileo was born in Pisa, Italy, on 15 February 1564, the first of six children of Vincenzo Galilei, a famous lutenist and music theorist, and Giulia, three of Galileos five siblings survived infancy. The youngest, became a noted lutenist and composer although he contributed to financial burdens during Galileos young adulthood, Michelangelo was unable to contribute his fair share of their fathers promised dowries to their brothers-in-law, who would attempt to seek legal remedies for payments due. 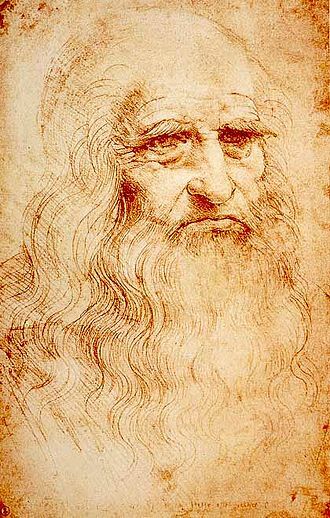 Michelangelo would occasionally have to borrow funds from Galileo to support his musical endeavours and these financial burdens may have contributed to Galileos early fire to develop inventions that would bring him additional income. When Galileo Galilei was eight, his family moved to Florence and he was educated in the Vallombrosa Abbey, about 30 km southeast of Florence. Galileo Bonaiuti was buried in the church, the Basilica of Santa Croce in Florence. 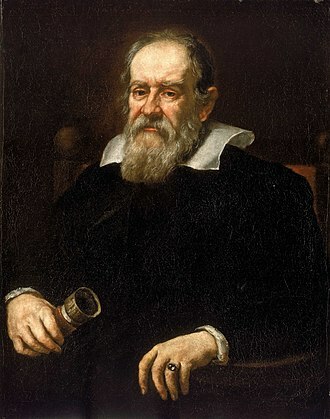 It was common for mid-sixteenth century Tuscan families to name the eldest son after the parents surname, Galileo Galilei was not necessarily named after his ancestor Galileo Bonaiuti. The Italian male given name Galileo derives from the Latin Galilaeus, meaning of Galilee, the biblical roots of Galileos name and surname were to become the subject of a famous pun. In 1614, during the Galileo affair, one of Galileos opponents, in it he made a point of quoting Acts 1,11, Ye men of Galilee, why stand ye gazing up into heaven. Despite being a genuinely pious Roman Catholic, Galileo fathered three children out of wedlock with Marina Gamba and they had two daughters and Livia, and a son, Vincenzo. Pope Clement XI, born Giovanni Francesco Albani, was Pope from 23 November 1700 to his death in 1721. Clement XI was a patron of the arts and of science and he was a great benefactor of the Vatican Library, his interest in archaeology is credited with saving much of Rome’s antiquity. He authorized expeditions which succeeded in rediscovering various ancient Christian writings and he was of Italian and Albanian origin. Giovanni Francesco Albani was born in 1649 in Urbino to a distinguished family, Albani was educated at the Collegio Romano in Rome from 1660 onwards. 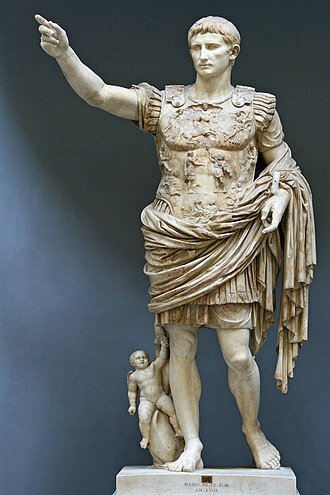 He became a very proficient Latinist and gained a doctorate in canon and civil law. He was one of those who frequented the academy of Queen Christina of Sweden and he would serve as a papal prelate under Pope Alexander VIII and was appointed by Pope Innocent XII as the Referendary of the Apostolic Signatura. Throughout this time, he served as the governor of Rieti, Sabina. He was ordained to the priesthood in September 1700 and celebrated his first Mass in Rome on 6 October 1700, after the death of Pope Innocent XII in 1700, a conclave was convoked to elect a successor. Albani was regarded as a fine diplomat known for his skills as a peacemaker and he agreed to the election after three days of consultation. Having accepted election after some hesitation, he was ordained a bishop on 30 November 1700, cardinal protodeacon Benedetto Pamphili crowned him on 8 December 1700 and he took possession of the Basilica of Saint John Lateran on 10 April 1701. Soon after his accession to the pontificate, the War of the Spanish Succession broke out, in 1713 Clement issued the bull Unigenitus in response to the spread of the Jansenist heresy. There followed great upheaval in France, where apart from theological issues, the resistance of many French ecclesiastics and the refusal of the French parlements to register the bull led to controversies extending through the greater part of the 18th century. Clement XI was key in the decision to allow cats back into Christian homes after they were seen as overtly Pagan symbols. Clement XI extended the feast of Our Lady of the Rosary to the Universal Church in 1716, Clement XI confirmed the cultus of Ceslas Odrowaz, Jakov Varingez, John of Perugia, Peregrine Laziosi, Peter of Sassoferrato, Buonfiglio Monaldi, Pope Gregory X and Humbeline of Jully. Pope Pius IV, born Giovanni Angelo Medici, was Pope from 25 December 1559 to his death in 1565. He is known for presiding over the session of the Council of Trent. Giovanni Angelo Medici was born in Milan on 31 March 1499 as the second of eleven children to Bernardino de Medici and he was not closely related to the Medicis of Florence. Giovanni Medici was the brother of condottiero Gian Giacomo Medici. Medici studied philosophy and medicine in Pavia, after studying at Bologna and acquiring a reputation as a jurist he obtained his doctorate in both canon and civil law on 11 May 1525. Medici went in 1527 to Rome, and as a favourite of Pope Paul III was rapidly promoted to the governorship of several towns, the archbishopric of Ragusa, in April 1549, Pope Paul III made Medici a cardinal. Under Papal authority, he was sent on missions to Germany. On the death of Pope Paul IV, he was elected pope on 25 December 1559, taking the name Pius IV. and installed on 6 January 1560. His first public acts of importance were to grant a pardon to the participants in the riot after the death of his predecessor. Luigi Vanvitelli was an Italian engineer and architect. The most prominent 18th-century architect of Italy, he practised a sober classicizing academic Late Baroque style that made a transition to Neoclassicism. Vanvitelli was born in Naples, the son of an Italian woman, Anna Lorenzani, and a Dutch painter of land and cityscpapes, Caspar van Wittel and he was trained in Rome by the architect Nicola Salvi, with whom he worked on construction of the Trevi Fountain. Later it was used as a hospital or as barracks. 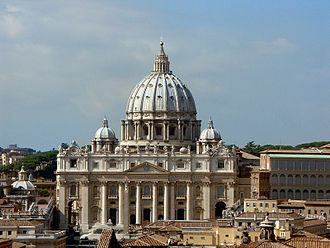 In Rome, Vanvitelli stabilized the dome of St. Peters Basilica when it developed cracks and he built a bridge over the Calore Irpino in Benevento. Beginning in 1742 Vanvitelli designed the Chapel of St. John the Baptist for King John V of Portugal and it was built in Rome, disassembled in 1747, and shipped to Lisbon, where it was reassembled in the Church of St. Roch. It was completed in 1750, although the mosaics in it were not finished until 1752, built of many precious marbles and other costly stones, as well as gilt bronze, it was held to be the most expensive chapel in Europe up to that time. The tomb of Pope Clement XI. 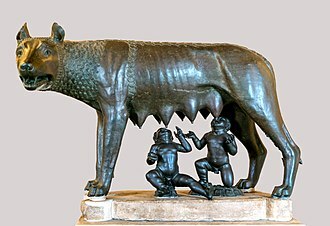 Possibly showing Luigi Vanvitelli as Apollo, carrying the world. Pope Clement XIV by Christopher Hewetson (1772). Tomb of Pope Clement XIV at Santi Apostoli in Rome. This artist's concept shows: supergiant Polaris Aa, dwarf Polaris Ab, and the distant dwarf companion Polaris B. Example of a 20th-century tribune: The Zeppelinhaupttribüne (1934) at the Nazi Party Rally grounds, Nuremberg, Germany.